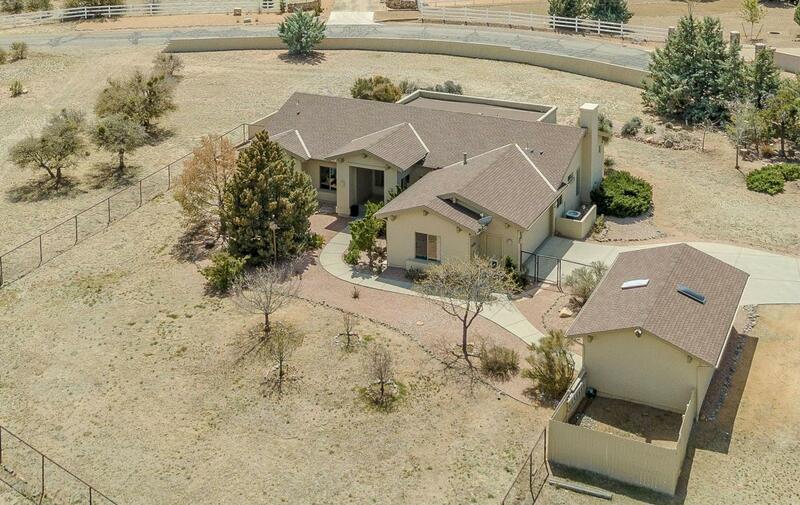 Beautiful Prescott home on 2 acres w/ stunning views of Granite Mountain! Bright open living room w/ large windows to enjoy gorgeous views! Gas fireplace in the family room is perfect for keeping warm on cooler evenings while entertaining guests. Spacious kitchen w/ island & tons of storage including large wall pantry, great for any at-home chef. Retreat to your master suite after a long day w/ private access to patio, walk-in closet, double sinks w/ vanity counter, & relaxing garden tub. Great wood beam accents throughout home! Fire sprinkler system, large laundry room w/ utility sink & extra storage, 2 car attached garage, & bonus detached 1 car oversized garage. Enjoy the serenity of your peaceful home while sipping coffee on back patio w/ amazing views. This home will not last long!